There’s something about the game of soccer that turns (presumably) otherwise mild-mannered, law-abiding citizens into raving madmen. 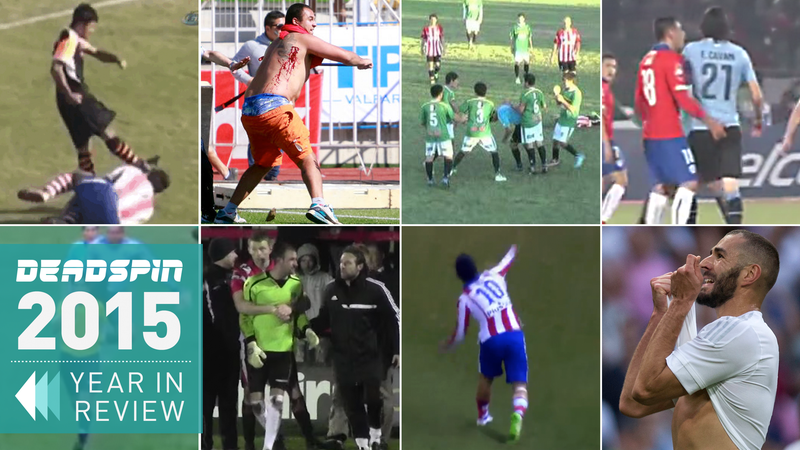 Players, fans, refs, even club officials often lose their minds when anywhere near a stadium. Here are our posts from 2015 documenting this curious sociological phenomenon. Non-stop action from kickoff, an opening-minute goal from the all-of-the-sudden rejuvenated Fernando Torres, a dubious penalty call, two more incidents that could’ve easily led to pens, and five total goals made for a bonkers first half in today’s Atlético Madrid-Barcelona Copa del Rey match. Then Gabi got himself red carded during halftime and Arda Turan came out chucking his shoe at the sideline judge, and things went full-blown insane. Way down in the bowels of England’s soccer pyramid lies the Isthmian League and teams like Kingstonian and Bognor Regis. This is the realm where players play for the love of the game, and fans attend for the love of the drink. Occasionally, the two sides collide. A yellow? 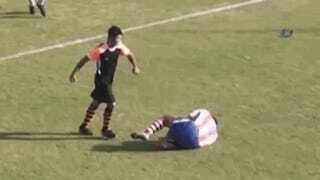 You’re going to try to embed your cleats into this unsuspecting referee’s vertebrae for a measly yellow card? The world’s a cold, cold place. Supporters of the Black Stars of Ghana fled the stands and sought refuge on the pitch as fans of the host Equatorial Guinea side reportedly attacked them leading to a suspension of the Africa Cup of Nations semi-final today in Malabo. This is what happens when you concede your fifth goal of the game and still have about 10 minutes left to play deep in Brazil’s soccer pyramid. You not only point fingers at your teammates; you ball those digits up and throw them at their faces. Mexican national team coach Miguel Herrera is a crazy person in good times and in bad. You’d think that good times would bring out good-crazy, and that Mexico’s referee-delivered Gold Cup win would elicit those happy emotions. But according to Mexican journalist Christian Martinoli, Herrera was not feeling too friendly after his team’s victory. What part of “you can’t use your hands” don’t you get, Gonzalo Jara? AndCavani was the one who got sent off? There’s no justice in this world. Soccer itself—and lower leagues especially—is prone to a kind of reckless, senseless violence not typically found in American sports. Toss in a heavy dose of Russians to the mix, and what is already often a caustic concoction turns downright toxic. Look, if lower league refs keep getting punched and kicked and knocked out by irate players, this will be the natural end point of these things. Gabriel Murta’s response to being punched and kicked by a player in an amateur match in Brazil was just ahead of the curve. This has just about everything you get from horrible soccer fandom: A bunch of idiots on the field, indiscriminate wielding of metal poles, flares, chairs being used as weapons, riot police, and a match ruined because the guys in the stadium would rather demonstrate their superiority mano a mano rather than sublimating it through the teams on the pitch. Well, this is certainly one way to mark the culmination of the Bolivian league season. Not the best way, mind you, but one way. Ahead of today’s Manchester City-Sevilla Champions League match, a bunch of fans met in the streets of Manchester and partook in a huge fight, chucking an insane number of chairs and tables at each other, proving yet again that soccer fans are the worst. It’s official: CSKA Sofia fans are the realest. Leyton Orient got themselves a big win yesterday over Portsmouth down in League Two, the fourth-division of English soccer. After the 3-2 win, Orient owner Francesco Bechetti ran onto the field and delivered a kick to assistant manager Andy Hessenthaler.